The Family of the Rose Medicinal plants in the rose family are some the best woman's botanicals used to slow heavy menstrual bleeding. Agrimony is one of the ancient medieval wound herbs,(yarrow is another) that help to stop bleeding both internal and externally. Like all it's more glamorous relatives agrimony is highly astringent. The tea has a pleasant lemon taste that makes it easy to take. 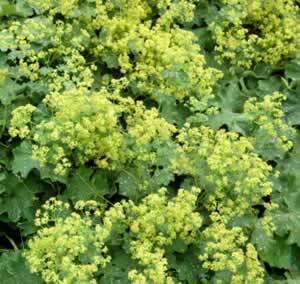 Lady's Mantle (Alchemilla vulgaris)	is found both in the wild and in the cultivated gardens of wise women. It contains salicylic acid, tannins and has sedative properties that help to alleviate cramps and painful menstruation. Raspberry leaf tea has a time honored country traditional of use to still bleeding and cramps and discomfort and in the last stages of pregnancy to facilitate childbirth. Black Haw Viburnum prunifolium Its common name is Cramp bark and indeed it is one of the first herbs to consider for uterine cramps and dysmenorrhea. Cramp bark (Black haw) has a high tannin content that slows heavy bleeding and the herb is a gentle sedative as well. Shepherd's purse Taken alone or combined with yarrow, Shepherd's purse will arrest heavy menstrual bleeding. Both sage and shepherds purse contain chemicals to prevent blood clots from forming, making them useful in heavy menstrual bleeding. Ody,Penelope . Home Herbal , DK ADULT, (1995): Agrimony is a very astringent herb, and is useful in bladder infections, and can ease heavy menstrual bleeding. Rosemary Gladstar. "Herbal Healing for Women" Fireside, (1993) Lady's mantle has been used throughout history to treat menstrual irregularities and difficulties. Rich concentrations of tannin make it especially valuable in curbing heavy or excessive menstrual flow. Rosemary Gladstar. 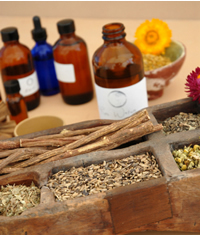 "Herbal Healing for Women" Fireside, (1993) Cramp bark quiets uterine cramping, and the high tannin content slows heavy bleeding, making this vibrurnums excellent choices for threated miscarriage, uterine cramps, and dysmenorrhea..